It is that wonderful time of year when the sun is bright, wind sharp around the autumn colours of the trees in their final show, and with the swallows taken flight we are left now with only a parliament of crows and a peep of chickens to keep us company. 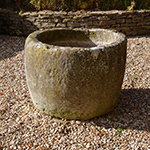 So here is my latest stock update to cheer you up - possibly..
Troughs abound - I am not sure if the is a collective noun for a collection of collective nouns but possibly neither is there one for troughs? So I am therefore staking claim to what we have here which surely must be a 'peak of troughs', not up there with an exaltation of skylarks I grant you, but good fun all the same. Please see images below. To stock newly carved - Introducing the Quercus Robur Table - a mighty fine Oak table made for outside being hewn from years old air-dried oak sourced from our local timber yard and made using pegged mortise and tenon joints, to our design, just down the road in Winchcombe. If I were being expansive I would say we are helping to revive the 'Cotswold School', though in reality we are merely following our instincts to carry on the long tradition of Arts and Crafts woodworking, started here in Gloucestershire back in the 19th century. The Quercus Robur table is available in 9ft as shown and 6ft and 11ft lengths, or can be custom made to your requirements. 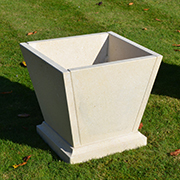 And to complement our ever popular copper planter range we have introduced a new design stone planter 'The Naunton Park Planter' to reach the parts that other coppers just can't reach (sorry a very tired advert slogan), available in natural stone as shown or with an umber wash. Gypsy Caravan - Well technically it's a showman's wagon as gypsy caravans have wheels on the outside the carriage, where here you will see that the wheels are neatly tucked under. This type known as a 'Burton Wagon' comes fully restored with the interior decorated by my Mum Suzy - I thank you - and all the painting painstakingly revived and relined by our neighbour Richie - I thank you too. With a working stove and extending bed this is Uber glamping, which when you become 'oh so weary' of the aspect from your window you can simply have yourself moved to another Arcadian idle around the corner - I think the pictures tell a much better tale than I ever can so please do have a look even if just to be nosey. 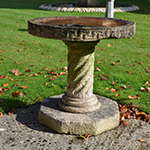 To our stock in trade - Fine garden ornament abounds starting with this wonderful birdbath - Bath stone on an octagonal base with a sugar twist column and bowl, decorated with a Greek key motif - what more could a bird want. Just ready for a ubiquity of sparrows, a charm of goldfinches or a breast of robins, though I prefer a reliant! A wonderful, and as far as I know, unique garden gate tactically painted black - I can then offer to both Lancashire and Yorkshire without fear of reprisal. A French composition stone lion having a distinctively straight tail - I once sold a similar tiger to Sylvester Stallone at an antiques fair (Rocky and eye of the tiger and all that). He is a might of a beast and would hold the eye for any vista with his tail of nobility - see the Duke of Northumberland and his lion at Syon Park and Alnwick. And for ferocity one can see a similar model in the bronze 'Lion killing a serpent' by Antoine-Louis Barye. Here is an interesting note from the Louvre description; 'The lion is the supreme example of a monarchic animal, a symbol of force and courage. This sculpture is thus also a tribute to the July Monarchy and King Louis-Philippe, at a time when there was widespread discontent with the regime established after the July Revolution (1830). The king's accession to the throne had taken place under the constellations of Leo (the lion) and Hydra (the sea serpent). The sculpture therefore symbolized celestial approval of this political change'. Another fine house Woolton Hill is where this marvellous alabaster and bronze reflecting bowl once stood - its owner Vera Sklarevskia / Berger / Cottingham / Lilley / Hue-Williams died a rich woman, though as her name suggests the first divorce and subsequent three dead husbands did contribute each in turn to her living the highest of high lives - often no doubt partying hard at next door Highclere Castle, the real 'Downton Abbey'. To conclude, a fine and gorgeously grotesque Italian marble fountain mask. Carved in the Renaissance manner, this 19th century marble spout sports the elongated ears of a faun, which could be one of the attributes of Pan, alternatively, it could simply be a bloke with big ears and a big nose with flowers in his hair - and who said eloquence was dead. Please do say if I can help with any further information on any of these items - that is after you have clicked through to see all behind the picture.